In this instructable I have made a Hobbit door to hang on a wall, it is in fact Bilbo's (and Frodo"s) door. When it is closed you see the inside of the door (within Bag End). When you open the door you have a view from the Shire with a quote from Tolkien. I made my Hobbit door from a clock housing as the frame, balsa wood to make the door, and I needle felted the view of the Shire. I also crochet some little flowers for Bilbo's garden. Green( 2 shades), brown, black, gold and sky blue paint, also some glow in the dark paint and glitter for the mark Gandalf left on the door. To begin, I took apart the clock case so that I just had the circular frame. I traced the inner opening onto a sheet of paper and used the width of the balsa wood to plot out how many pieces I would need and their length. After cutting each of the pieces, I sanded them and glued them together with wood glue. Once the glue has dried, I cut and sanded the edges of the boards to form a circle that can fit inside the clock frame. It helps to trace the circle onto the board using the frame. It should have a snug fit but can open and close freely. To paint/stain balsa wood it you need to treat it first with a wood conditioner. If you don't have any at home and you don't feel like buying any you could use a 50:50 mix of pva glue and water. For the inside of the door (inside of Bag End) I used a brown water colour paint to stain the wood. The outside of the door I painted with a bright green. I painted the outside of the door frame (clock casing) with brown paint. I used some air dry clay to make the door knob. I painted the knob with gold paint. Once the paint had dried I added a bit of black and distressed it a bit (Bilbo had repainted his door just prior to his running off on a adventure but I don't think he repainted the knob). I then glued the door knob to the centre of the door. Gandalf scratched a rune on Bilbo's door so that the dwarves know which Hobbit hole to go to. The mark means something along the lines of 'Burglar wants a good job, plenty of excitement and reasonable reward or you could say Expert treasure-hunter instead of Burglar". I used glow in the dark paint to draw the mark on the door and added a bit of glitter to make it look magical. As nice as the bright green paint on the outside of Bilbo's door, the inside is just as lovely. The inner door is covered with very ornate ironwork, you can see this in the movie. I used hot glue painted black to imitate the ironwork. Another option would be to use clay. I used an image of Bilbo(Martin Freeman) standing in front of the door as a guideand printed it out in black and white the same size as the door I made. I applied the hot glue along the lines of the ironwork trying to keep it consistent and smooth. Once the glue had dried/hardened I peeled it off and trimmed it to make it look neat. I then painted it black. I used some tin from a tea light holder and wire (22 gauge) to create the door latch. Again clay would be another option (I might try making it again to get it to look better). I basically made two box shaped piece, the larger piece on the door and a smaller piece on the frame. 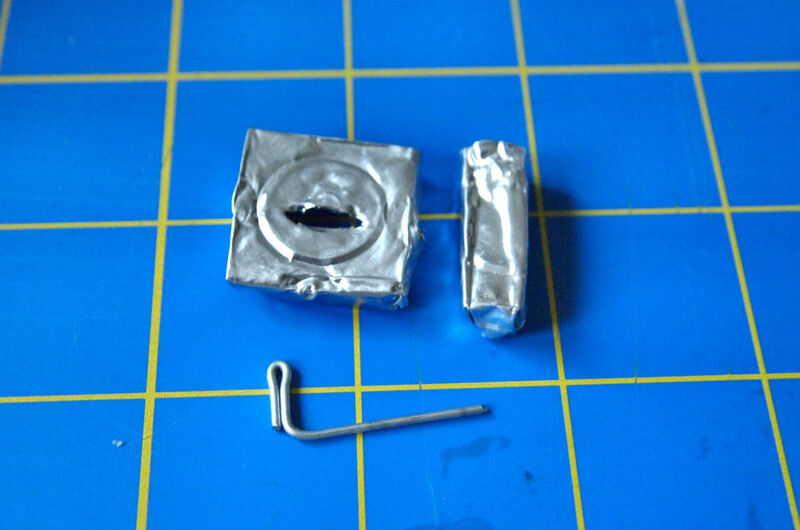 I bent a small piece of wire for the handle and cut a slit and holes in the boxes so it can act as a latch. Next I painted all of the pieces black. I had a small hinge about 2cm long, but I needed it to be smaller and I needed it two of them. I managed to cut it in half and it worked fine. I painted the two hinges and the tops of the screws black. I laid out my imitation ironwork onto the door and lined up the hinges. I screwed the hinges to the door and frame (make sure it opens outward with hinges on the left). I glued the ironwork onto the door with pva glue and then glued the latch to the door and frame with super glue (make sure that the two latch pieces align properly). So this is the part where we create the view from Bilbo's door. I made mine with needle felting and the flowers by crochet. If you are not into that, you could try drawing, painting or creating something with clay; these were some of the things I had considered doing myself. 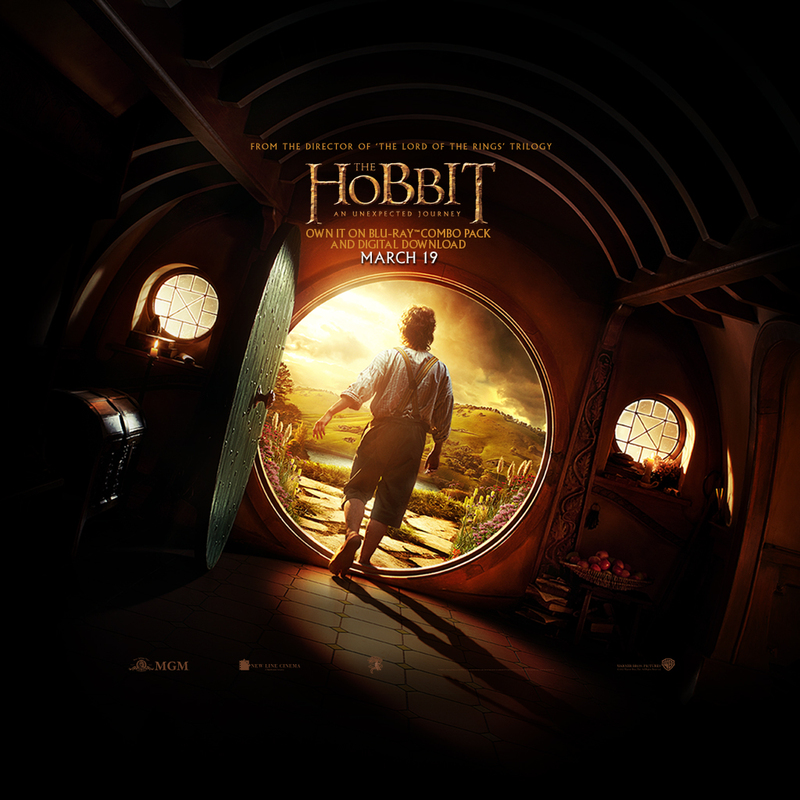 I used one of The Hobbit movie posters of Bilbo standing on the threshold of his door as a guide to make my view of the Shire (though he is standing in the way). So I am new to needle felting (this is actually the first thing I've done) and I am aware that one normally uses wool roving. I didn't have any on hand and there are no stores nearby that sell it (that I am aware of) and I didn't want to wait for shipping if I ordered it on the internet. So I cheated, I used craft felt which I had an abundance of and in a (large) variety of colours. You can pull apart the craft felt with your fingers or a slicker brush (pet brush). A standard size rectangle of craft felt can yield a fair amount and if you use several shades (I had about 5 shades of green) you can blend them together nicely. A note about craft felt though, they are not all the same. Craft felt is normally made from wool, but there are some sold now (like at Michaels) that are made of recycled pop bottles (which is pretty awesome when you think of it). However it is a lot harder to pull them apart, though if you do get enough apart you can still use it for felting. I started with a sheet of sky blue felt as the background. It should be wide enough to cover the inside of the door. I then began blending shades of light green and needle felted them onto the background to form the rolling hills. I continued to shape the hills, then added a little lake with blue felt. I added some little Hobbit houses with blue, orange and red doors, windows and chimneys with smoke rising from them. With darker shades of green I made some distant bushes and trees on the hills. With white felt I put some light clouds in the sky. For the party tree, I used a piece of brown embroidery floss for the trunk. I needle felted it onto the background in the same way as you would do with roving. I then added some single strands to form the branches of the tree. And then finally added some dark green felt for the leaves. I used another piece of craft felt as a background for the stone pathway leading from the door. I cut it into the shape of a half circle (with the same diameter as the door frame). I formed the stones with grey wool using the photo (from step 10) as a guide. In between the stones I used a dark green colour. Along the sides I used a lighter green, this is were the flowers will go. There is a bank of grass along the top edge, this is were the path turns. I left about on inch of the background uncovered, this will be turned under when I attach it to the other piece. Bilbo has an abundance of pretty flowers on either side of his door. I crochet these with embroidery floss in pink, purple, light red and two shades of yellow and a 1.15mm crochet hook. *ch 2 or 3, sc into hole(the 2nd ch from hook above), repeat from * 5-6 times. I made about 7-8 flowers of each colour. I bent the end of a piece of wire into a spiral and poked the other end into the centre of the flower. The stem is about 5cm long. I covered the wire stem in glue and wrapped green embroidery floss around it tightly. I painted the spiral end of the wire with pink or yellow paint. From the photo (in step 10) there appears to be some tall grass gone to seed (or cat tails?). I made these using a bit of white wool and felted it into an oblong shape and glued some green coloured wire to the end. I made eight of these, four for each side of the door. Depending on the angle in which you look at the door you can see the inside of the frame so I painted it a light blue for the sky and light green for where the ground is. I used the felted image as a guide for where the sky begins. I used a small piece of green craft felt to hold the flowers by poking holes in it and arranging the flowers in bundles. I divided the flowers up so that there are roughly equal numbers for each side of the door. The purples and pinks are towards the front, reds and yellow towards the back, reds higher up and the grasses are in the far back but are the tallest. I taped the back of the craft felt with duct tape to hold everything together. I trimmed off the excess tape and wire that stuck out. I then glued the felt piece full of flowers to the inside of the door frame. They should be situated on either side of the pathway leading out of the door. I downloaded a Tolkien Font called Tolkien Regular. I typed up the two lines and printed it off in several sizes (I wasn't sure which would fit best until I tried them out). I coated them with some Mod Podge and cut them out. I glued two strands of nylon thread to the backs and used it to hang the words from the inside of the door frame. There is an extensive list of Tolkien quotes here if you want to use a different one. Or similarly from the movie: "I am going on an adventure..."
Over the wood and mountain tall. . ."
I needle felted the two pieces (the pathway and background) together. I then cut some cardboard in the shape of the pathway and glued it the underside of the pathway. The cardboard will support the pathway as it will sit at an angle leading down from the door. Now we need to put the needle felted view of the Shire into the door frame. I cut out a large circle of cardboard, it should be the same diameter as the outside of the door frame. Glue the felted Shire onto the cardboard. I used a glue stick since a liquid glue like pva might leak through the felt. I used some folded cardboard to prop up the pathway so that it will angle down from the doorway. Place glue along the bottom rim of the door frame and line up with the cardboard circle, wipe off any excess glue and place something heavy on top to hold it down with the glue dries. I needed two hangers on the back of the door since when the door is open it's weight is shifted to one side. I measured a line across the top quarter of the back of the door and glued on the two hangers. I then reinforced it with duct tape to make sure it would hold the weight. This is amazing....!!! Really excellent job! I loved it! I agree with zkhokhar. The thing IS a beauty! This is absolutely GORGEOUS! Truly a thing of beauty. I'm a little afraid of diving into felting, so maybe I can manage something with paint and torn paper? Perhaps a little Shire-collage. Actually, I'd like to adapt this into a small pendant. Either openable like yours or, if a nice hinge isn't feasible at that side, perhaps the Shire-view on the reverse of the door? I'll be busy plotting. Thank you so much for the inspiration! A small pendant would be really cool, I would love to see how it turns out. Congratulations ChrysN! I love this instructable, it is so different! Congratulations for winning Furnishings Special Judges' Prize in Furniture Contest. Great Show. I almost missed this. What a fantastic project. Your projects always inspire me! Thanks for sharing! Brings fond memories just looking at it, I really enjoyed the books. cool idea. my only peeve with this is that the handle is supposed to be in center of the door.